Most artists need collectors if they’re expecting to be career artists, but this collector did not toss out calling cards to the hundreds in attendance, nor identify his name. It’s likely that this collector, and many others, enjoy the prestige of collecting art, yet collectors are not public figures. (The highest echelon of philanthropy is the “anonymous” donor). If you are an artist in Chicago you can probably name fifty fellow artists, twenty art galleries, and maybe one art collector. This collector revealed a double-edged secret: collectors don’t need artists. 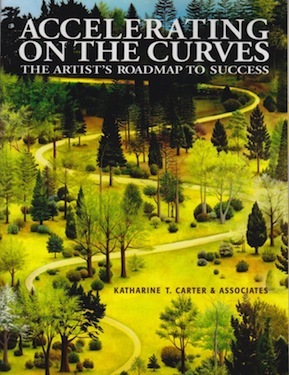 “Each and every month commit to identifying a minimum of fifty potential collectors and make at least one sale,” writes Katharine T. Carter in her new book, “Accelerating on the Curves: The Artist’s Roadmap to Success.” Her other advice for an artist to maintain good collector relations is to host an annual holiday cocktail party at your studio, send a glass of champagne to a collector’s table if you spot them at a restaurant, always thank them for a sale with a handwritten note, and update them with news about your current exhibitions. This last bit mirrors the complaint of the unidentified Chicago collector. Carter’s words of wisdom are not, in fact, unrealistic, but how does an artist who is not represented by a gallery connect with collectors in the first place? “Get creative,” she says. Collectors are not just museum aristocrats, but also your dentist, accountant, realtor, or friend who is an interior designer. These folks, who don’t shop at art galleries, have the power to purchase your art if they only knew you were an artist, she writes. “The Artist’s Roadmap to Success” is the latest do-it-yourself art business manual. It joins a small but growing genre of workbooks aimed at the type of artists begging for rules in this unregulated and conflicted art world. As such, Carter’s book makes use of a motor vehicle motif (taking the wheel and accelerating on this superhighway may lead you on detours or dead-ends, etc). The workbook is the product of a decades-long career as an art advisor and collaborator with arts professionals, and Carter peppers her three-step program to artistic success with nuggets of experience and real-world expectations. “There are no guarantees of any kind in the art world,” she writes, and success can take at least fifteen years of hard work. Carter’s assumed reader is an artist who aspires to show in art galleries, make a living from sales, and whose climax of success might include being selected for the Whitney Biennial. Carter proceeds as if the art world were a smoothly operating machine built to reward all good artists. After you identify your fifty collectors and make some sales, you need to befriend curators and have group and solo exhibitions at increasingly prestigious venues. But this charm-school guide for artists needs a troubleshooting section. What if the curators on your list of pivotal exhibition sites simply dislike your work? How do you contact galleries that explicitly discourage cold submissions? How do you cultivate established collectors, not just sympathetic friends? Carter’s main premise concerns the building of a network of supporters, a truism in our day of an ever-expanding art world. Her best gems of strategy, though, are found in asides and digressions. Artists can have direct access to curators by joining museum affiliate groups, she writes, and even get their work into collections through donations. Carter would do well to finesse these strategies for her readers, as some of her co-authors do, but artists who are taking the self-enrichment route and reading books like this should also consider reading their antidote, the gossipy, behind-the-scenes tales such as “Seven Days in the Art World.” The art world is all about negotiating specific personalities, not generalities. I sometimes hear artists ask, how do I show outside of Chicago? Carter addresses the transformation of a career from local to national, and is realistic about the timeline, but dare I say, she is too hopeful. In her epilogue, Carter offers an anecdote as metaphor. She embarked on a weeks-long European pilgrimage and was yards from the pinnacle of her hundreds of miles-long journey, a holy shrine, when the priest in-charge stopped the line. Carter admits to sobbing at her unfair share, but then a fellow traveler “said something in Spanish” to the priest, who proceeded to open the gate just for Carter. She says she gained access to her final destination because she stayed committed. But the truth is, a stranger intervened on her behalf, and someone else held the key that opened the gate to her goal. There is no guidebook to getting lucky, but I wish there were.